Celebrated annually on August 26, National Dog Day exists to “help galvanize the public to recognize the number of dogs that need to be rescued each year and acknowledges family dogs and dogs that work selflessly each day to save lives, keep us safe, and bring comfort.” Adopting a dog is an exciting time for new and experienced pet parents; and to celebrate, we’ve partnered with some PAWSitively PAWSome companies to shower your furry friend with fun! Enter here to win. Wondercide, as seen on Shark Tank, manufactures a full line of safe and effective pest control solutions for pets, people, and property, in addition to a full line of holistic pet care products.Wondercide is powered by an innovative, patent-pending technology that uses proprietary essential oil blends to kill by contact and repel pests. You’ll win a gallon of Flea & Tick Control for Pets + Home, Ready-to-Use Flea & Tick Control for Yard + Garden, soothing Skin Tonic Spray, a Flea & Tick Natural Shampoo Bar with citronella & geranium, an Exfoliating Natural Shampoo Bar with neem bark, a Hypoallergenic Natural Shampoo Bar with Aloe, a moisturizing natural shampoo bar with oatmeal & honey, Fidoplex hip & joint supplement, Neem Bark Powder, a natural Ear Care Kit, DETOX ultra pure bentonite clay and a Wondercide T-shirt! PrideBites, as seen on Shark Tank, is the only place you can easily use your pup’s name and picture to make one-of-a-kind personalized pet products. “Your Pet, Your Choice.” You’ll win a custom dog bed, blanket, placemat and toy basket! Kurgo‘s mission is to help dogs and their owners get out and enjoy an active lifestyle together. 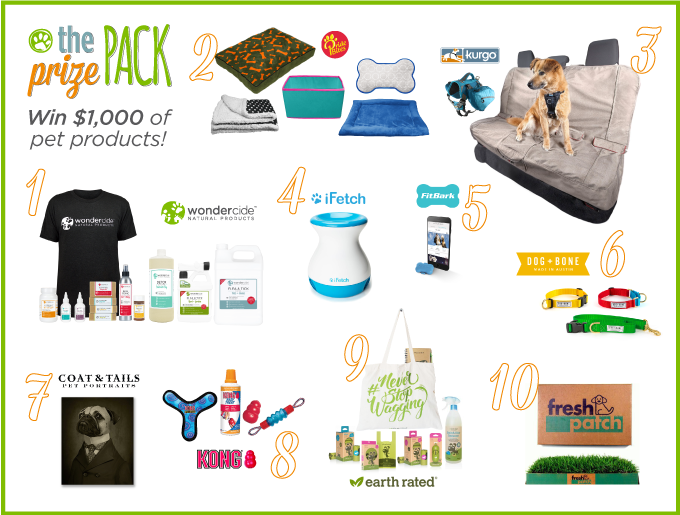 You’ll win a Baxter dog backpack and heather bench seat cover! iFetch is an award-winning automatic ball launcher for fetch-loving dogs. You’ll win the newest addition to the line, the iFetch Frenzy! FitBark is on a mission to get dogs and humans healthy together. Health & fitness on both ends of the leash! FitBark monitors your dog’s everyday activity and sleep and turns it into BarkPoints, so you can track progress. You’ll win a FitBark dog activity monitor! Dog + Bone‘s goal is to create simple, honest, classic products that enable you to enjoy more unforgettable adventures with your best friends. You’ll win an adjustable leash and your choice of a snap or martingale collar! Coat & Tails Custom Pet Portraits gives you the opportunity to choose the clothes and accessories that best suit your pet’s personality for a one-of-a-kind portrait of your furry friend. Coat & Tails also offers T-shirts for sale, with $10 per shirt sold going directly to help rescue groups. You’ll win a custom pet portrait from the readymade clothes collections! KONG toys are the best of the best in quality, originality, variety, safety, and value. “Give a dog a KONG. They’ll be the first to show you: it’s not just a toy, it’s a KONG.” You’ll win a mix of KONG Classic treats, plush toys, and interactive toys! Earth Rated is a company of dog owners that makes products to help other dog owners do their part! You’ll win a 6-month supply of extra strong and reliable dog waste bags. Prize pack includes leash dispensers with refill rolls, and bags with handles. As a bonus, you’ll also receive a full-sized bottle of their new stain & odor remover! Fresh Patch, as seen on Shark Tank, conveniently brings the backyard to the balcony for beloved Fidos and Fifis everywhere. Their hydroponically-grown grass is a stylish alternative to traditional synthetic pee pads. Fresh Patch real grass is also loved by cats, rabbits, turtles and other small pets. You’ll win a standard Fresh Patch! So, who’s ready to get some free stuff?! Hop over to our contest page for more details and to enter to win the National Dog Day giveaway! 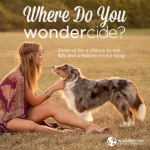 CONTEST: Where Do You Wondercide? I would love to win! My chloe would love any of the prizes but mostly the wondercide. We can’t use flea and tick spot treatment on her any more as she has seizures. My brother saw it on Shark Tank and he ordered some right away. He loves it. Thanks for the great giveaway!! So glad you’re enjoying the products! Thanks for choosing Wondercide! Please enter me! I was an early Wondercide adopter! Hi Tamara! Thanks so much for your support 🙂 Be sure to click the link in the post to enter to win! This would be an awesome prize. Great products. Would love to win…have 3 small dogs…one 15, one 13 and a new adoptee, age 2. We’d love to see a photo of your furry friends! I have been using your yard product for two yrs now! I love that we can put something in our yard that is not bad for dogs! So far so good, no fleas! I have been using your products for about 3 years. I first used Evolv for my dog. I tell lots of people about them and recommend them to my pet dog training students! Thanks so much for the support, Linda! Please visit this page to enter the contest! Thanks for entering! 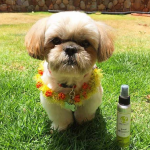 Wondercide is a fantastic product…Our Eddie loves when we put it on him, I think it makes his coat shiny too. Glad we saw you on Shark Tank. Thank you, Karen! We are so glad to have you as a customer! I first saw Wondercide on Shark Tank. I couldn’t wait to use the products. I found a local mom & pop store in my area from your web site. This ( IS A PAWsitively PAWsome products). and kind hearted company. Thank you so very much for all you do ! Thanks so much for the kind words, Greg! Would love to win, Wondercide isn’t available locally for me. Our little Mia would love to win, can not find Wondercide in my area. I have been a customer for two years now. I have two of the cutest yorkiepoos Bella and Mia. Mia cannot have topical flea med as she has seizures. Wondercide is wonderful and I tell that to everyone that has dogs. I was so excited watching you on Shark Tank. Those sharks took a bite of a good thing. I cannot thank you enough. Bella and Mia thank you too. Thanks so much for your comment! We’d love to see a photo of Bella and Mia on our Facebook page sometime 🙂 Thank you for being a great customer! I have 2 wonderful dogs that take great care of me. I can’t afford much but I give them every thing I can. This would be great to win so I can show them how much I appreciate them and love them! 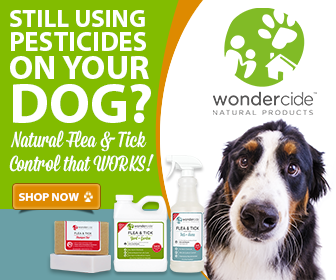 We have been using the indoor and outdoor Wondercide this Summer and it is amazing! I have also been using the mosquito repellent myself and I love it. Thanks for this contest. Chopper and Paislee have their paws crossed. Would love to win. I have a never ending job as I’m a foster for animals pulled before euthanization. I’ve never tried your products, but I’d love to! I sprayed the wondercide on 1 sock and went into a flea infested room WOW! The wondercide sock had NO fleas on it! I love Wondercide and so does my dog……..so much that we give our friends dogs Wondercide also!!!!! my dogs are both rescues.